How do you describe your work, Jama? My work is very much a reflection of what I’m into at the moment that I make the piece. I’m very ADD when it comes to my craft, learning new techniques constantly and playing with the results. I guess you could call it contemporary tradition! I do everything from pieces that look vintage to incorporating computer parts into my pieces. As for my business name, I’m a HUGE Tori Amos fan and she has a song called “Precious Things.” It just seemed to fit! My creative process is all over the place! Sometimes I’ll order beads based on projects I want to do which may or may not start with a sketch. More often than not, I’ll order beads that I find interesting and will end up with a hodge podge of stuff. I tend to lay things out and see what appeals to me at the time. Or, if there’s a new technique I want to try, I’ll raid the bead stash and see what I think will work. There are pieces that require ALOT of time and I usually do those in little spurts of time. I just completed two pieces for a show called “The Mark of Great Art” sponsored by Maker’s Mark. 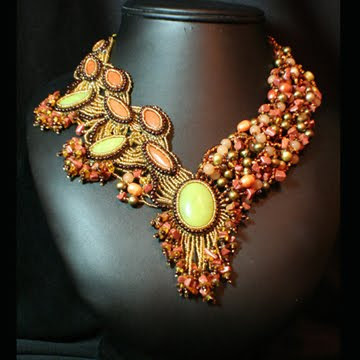 One piece was a RAW Swarovski cuff, the other a large breastpiece comprised of silver clay, wax, Swarovski and seed beads with embroidery and stringing. That particular piece came very close to being hurled across the room on several locations. That particular piece had a deadline and will go on tour, which drove me to complete it. My degree is in art with an emphasis in art history. I’ve been painting and sculpting since I was little and decided to pursue that as I got older. I’ve never actually taken a jewelry class, but have read lots and lots of magazines and books. 6 years ago, my OB/GYN kicked me out of my studio when I was pregnant, even though I ranted & raved that I worked with acrylics and there weren’t any fumes. I needed something to keep me busy for the next 9 months and that’s when I discovered beading. 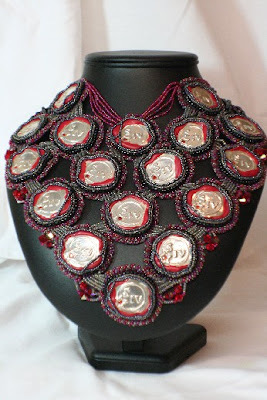 I started with stringing, learning stitches, worked my way through silver clay, wire, bead embroidery and just can’t stop! 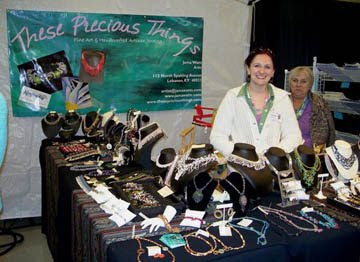 When my daughter was one, I opened up a gallery, selling my artwork jewelry and the work of other local artists. I’ve now been in business for a little over 4 years, spending my days beading at my desk or working on marketing. I think my background in fine art has a lot to do with the fact that I like experimenting with different techniques, color combinations and materials. I don’t seem to have a filter or anything that tells me that I can’t combine one item with another. It leads to lots of “happy accidents,” as Bob Ross would say. My round nose pliers – I’ll never forget when I finally splurged for a good pair! I almost always have music or something going in the background. If I’m at work, my iPod is on constantly. At home, I might have music or a movie on. Music is a big muse for me, as is the art world. A song or painting might move me to create something. And if I could, I’d bead all day (which I’ve been known to do on weekends!). I tend to bead any time I can fit it in, but I really like to sit and bead for hours, if I can. If I’m not creating, I’m going crazy. If I’m not beading or designing jewelry, I’m at least painting, sketching or playing in PhotoShop. I learned a long time ago that I have to keep going. If I get stuck on a piece or frustrated with it, I put it down and work on something else. I’m still creating, but I know myself and that I need to step away for a breather. Else, I’m not a person you want to be around! Don’t ever let anyone tell you that you can’t do something. If there’s a technique you want to try or materials you want to combine and people tell you that you can’t, prove them wrong! Or find out for yourself that it can’t be done one way, but can be done another. 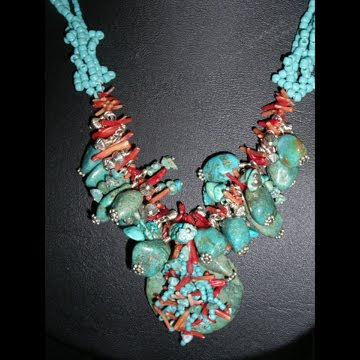 I tried peyote cab bezels and was never pleased with my results. 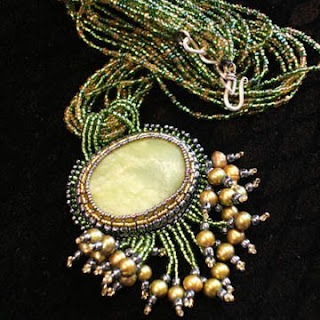 Then, I bought Jamie Cloud Eakin’s book “Beading with Cabochons” and discovered a whole new way of setting cabs in beads. Voila! But, I also know that I’ll try tackling that peyote bezel again, because I won’t let the beads win! I’m too stubborn! 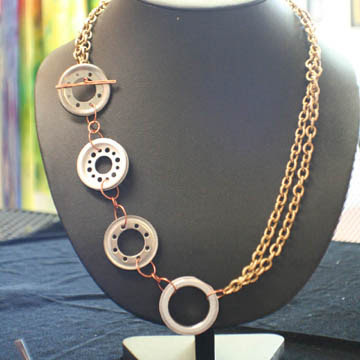 I think one of the biggest changes was when I decided (maybe to my demise) that I’d rather create wearable art than focus on what I think will be a big seller. It gave me the freedom to let myself go and create pieces that represented me as a whole, not just aspects of myself. Those pieces are little fragments of Jama. Oh my… I’ve got a 5 year-old in split K/1 who just started playing soccer, I run the gallery, do around 10 festivals a year, am president of our arts & humanities council, president of our main street committee and am involved with several other organizations within the community. I live in a great little town that’s coming into its own and I want to see it thrive and prosper, not just for myself, but for my daughter and the generations to come. I like to go go go! What’s your favorite comfort food and other favorite things? I’m a mac & cheese a-holic, but if it’s something that I make all the time, it’d be nachos with lots and lots of guacamole! I’m also a huge Harry Potter fan, both of the books and the movies and music means the world to me. I’m constantly trying to discover new artists and going to concerts. I’ll be dead broke but I’ll find some way to make it to a show!